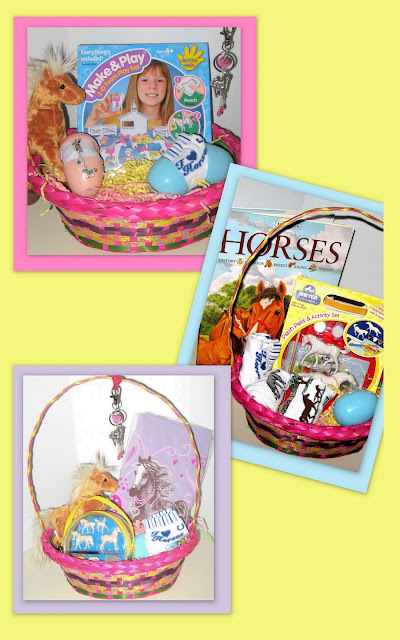 Horse Lover's Mama: Your Horse Lover's Easter Basket! Your Horse Lover's Easter Basket! Spring is for horses too! Hide a piece of Horse's Heart horse-charm jewelry in one of her easter eggs. Choose bag clips, zipper pulls or a necklace. Roll some of our new socks with horses to substitute for some of the eggs in her basket. Or, fill large plastic eggs with them. Add a soft, sweet, plush horse to her basket, or, perhaps a pretty knit top - ready for spring in aqua blue, with a beautiful horse, of course. Make a day of it with a horse arts and crafts set (prefect if you'll be out of town, or spending the day with relatives).